Rok is a Sangheili Warrior. He is an accomplished Wraith driver, evidence by his title as Tankmaster. 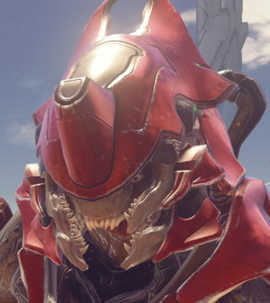 He is featured as a mini-boss in the Spartan-IVs' Warzone training simulations. Rok is the fifth boss to appear on Raid on Apex 7, and appears on the beach behind the Spire and between both central bases. Tankmaster Rok's Wraith is painted red and has increased accuracy and health from a usual Wraith. His Wraith cannot be boarded or hijacked. However, if it is disabled multiple times with an EMP, Rok will exit the Wraith to fight with a storm rifle and grenades. His empty Wraith cannot be driven. Killing one will award the team 100 VP, and earn the player a Legendary Takedown medal. Render of Rok driving his Sword Wraith. Tankmaster Rok inside a Sword Wraith. Tankmaster Rok driving a Sword Wraith. Tankmaster Rok on top of a Sword Wraith. Tankmaster Rok's Ultra Wraith in the Warzone Firefight Beta. Tankmaster Rok's Temple Wraith in Warzone Firefight.